And, as you can see... CHOCOLATE FUDGE. But did you notice? THREE.LAYERS.OF.CHOCOLATE.FUDGE. And yes, it's sugar-free! Even though I'm usually not a fan of sugar-free products because of all the strange additives and unhealthy, artificial sweeteners (like Splenda), I saw these bars at Whole Foods and just had to look at the labels. The Guylian Dark Chocolate has only five ingredients (woohoo! ): Unsweetened Chocolate, Maltitol, Cocoa Butter, Soya Lecithin, Natural Vanilla Flavor. 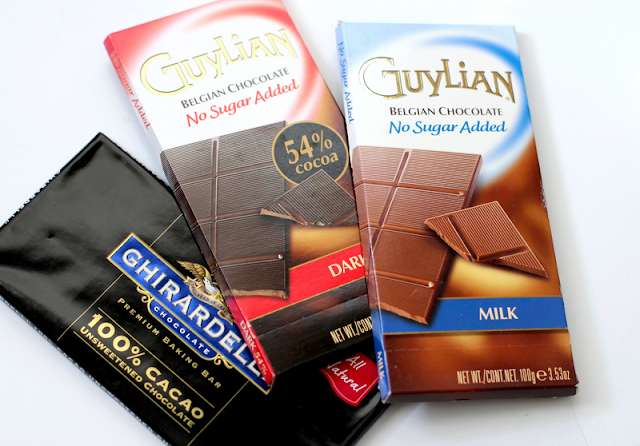 The Guylian Milk Chocolate has only six ingredients: Maltitol, Cocoa Butter, Whole Milk Powder, Unsweetened Chocolate, Soya Lecithin, Natural Vanilla Flavor. And the Ghirardelli has one simple ingredient: Unsweetened Chocolate. you know, the love of my life my childhood addiction? Since I cut out refined sugars from my diet, I no longer purchase Hershey's bars or condensed milk, so Guylian's chocolate bars and my recently made fat-free/sugar-free sweetened condensed milk solved my "can't-make-fudge" dilemma. The bottom layer of this magnificent fudge is made with the Guylian dark chocolate + my sweetened condensed milk. 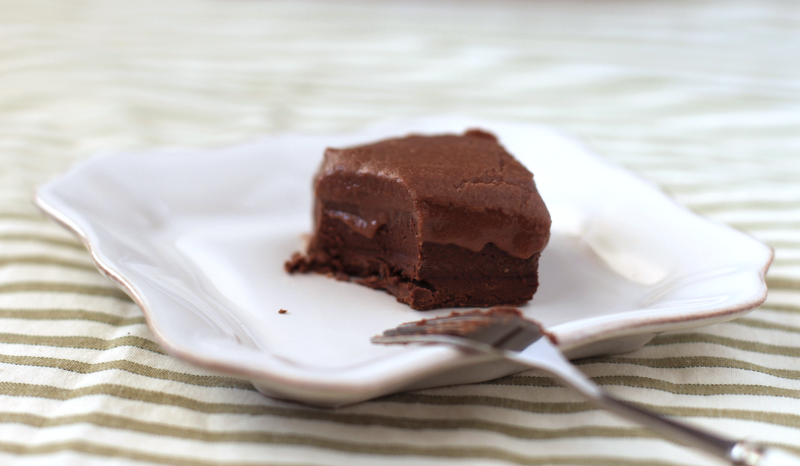 The center is made with the Ghirardelli unsweetened chocolate + my sweetened condensed milk. The top layer is made with the Guylian milk chocolate + my sweetened condensed milk. I mean, it's chocolate + chocolate + frosting. YUM! But, if you would prefer all three layers to be fudge-like, just read the directions #5. 3. For the bottom layer, add ~1/2 cup-3/4 cup of the condensed milk to the dark chocolate and stir. Start out with 1/2 cup, and work your way up to 3/4 cup if needed--mixture should look like paste. Scoop mixture into brownie pan and spread. Put pan in freezer while you make next layer. 4. For the middle layer, add ~1/2 cup-1 cup of the condensed milk to the unsweetened chocolate and stir. Start out with 1/2 cup and work your way up to 1 cup if needed--mixture should look a little different than the other mixture. If too dry, add more condensed milk. Take the brownie pan out of the freezer and scoop this mixture in and spread. Freeze again. Sorry, this isn't for you. I'm taking this one with me, thank you very much. even though they look loaded full of sugar (and taste like it), they're actually free of it! This is chocolate fudge in the truest sense. Really a must try! Wow, I'm impressed! This looks and sounds delish and love that there's no sugar. Refreshing! Can hardly wait to try it out! Omygosh YUM! 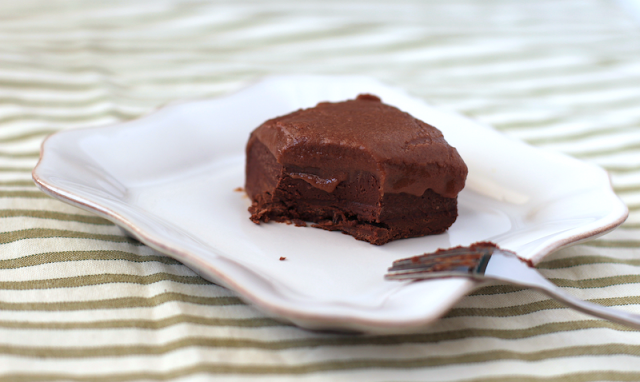 I'm so happy I just found your blog on food gawker :) This fudge looks amazing! On my list of recipe to try! Malitol actually has a MUCH higher glycemic index than sugar. I don't have the numbers in front of me, but it's something like 68 for sguar and 100+ for malitol. Malitol is absolutely the WORST sugar alcohol you can eat for your blood sugar, and causes more stomach upset in most people than even sorbitol does. From what I have read and researched, maltitol has a lower glycemic index compared to sugar. Maltitol has a GI of ~52. It can cause an upset stomach in people who are sensitive, I don't find myself sensitive to it so I am okay with this chocolate fudge recipe. It is important not to eat too much of maltitol (or anything for that matter), balance is key. I agree that maltitol is not good for diabetics because it DOES affect blood sugar levels, but I do not believe it is the worst sugar substitute. It is much better than aspartame and sucralose.